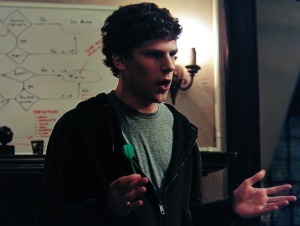 While watching the film The Social Network over the weekend one scene in particular caught my attention. Mark Zuckerberg and key members of the early Facebook team are meeting to discuss roles and ownership stakes in the company. I had to laugh at the implication that the PR guy might not end up doing much work or contributing substantially to the success of the company. Certainly team members that were providing capital or creating the actual product had greater value at that point, and Facebook was doing well through word-of-mouth so a comprehensive PR plan was probably not a primary concern. And few would argue against the importance of PR and marketing in launching and growing any new business regardless of how formalized those efforts are. Rand Fishkin covered this well on SEOmoz earlier this year. So the question is: how much is a PR professional worth to a startup? The short answer is it really does depend on the situation; how much of a role PR will play in the early phases of the company, what the specific PR person brings to the table, etc. It also depends on who you ask! Those more focused on technology or finance may have a different perspective on the value of public relations in getting a company off the ground. There may also be a tendency to not assign as much value to things that are not necessarily as tangible early on. But that doesn’t mean that PR and marketing do not play a vital role in the development of a company. So what do you think a PR person is worth to a startup? As a startup founder, you have so much to do focusing on the product, team, customers and raising money. PR often falls by the way side or gets starved attention. What we have done is try to do as much of it ourselves (granted limited results) and then in bring in an expert (ours is the Fabulous Shonali Burke – @shonali on Twitter) for when we know we need expert guidance on a campaign, story or big announcement. That has been a good approach for us at KikScore so far and that has allowed us to get very valuable help on the PR side at the right time and within a tight budget. I’m coming from a position of bias, but I think PR and marketing is critical in a start-up’s launch and growth. How will people know you exist if you aren’t telling them? PR and marketing like Gini said it is critical if it is done right. At least 5% in my book. Nice post. Raj – there is no better professional than Shonali! She is, indeed, Fabulous with a capital F.
I completely agree with Gini and believe early stage PR/marketing is crucial to startup success. Yes, there has to be a product and financial backing, but to truly engage an audience and win its loyalty there has to be a story. And, the telling of the story is just as important–if not more. If startup founders recognize this value up front, they’ll avoid costly mistakes that can rob a young company of momentum down the line. Raj – thanks for sharing your experience. I think in any bootstrapping situation PR tends to get left behind, so your hybrid approach sounds like a good approach. Gini – while bias myself I do concur! It’s always a little bit of chicken and egg; you need something great so people will come and stay, but without awareness they may never come. And even companies with good word-of-mouth benefit from having someone develop strategies to make the most of it. Gavin – a single digit percentage sounds reasonable, depending on what other compensation is involved and what the specific PR person is bringing to the table. I honestly didn’t have an answer to this when you pointed me to it yesterday, Adam, and that’s why I thought of Raj, since he’s in exactly that position. I didn’t know he’d give me a glowing recommendation as well, LOL. I’m now going to take this back even further, and say that before you’re ready to tell people about your startup/product/service, you need to make sure you have a good “face” on it. Kind of like how we women (ok, and some men too) put on makeup before going out of the house. I can’t tell you how many startups – and even larger organizations – I’ve seen who have a terrible web presence, their messaging is all over the place… ugh. They have absolutely no concept of what it takes to pull all that together, and IMHO it’s a huge mistake to embark on outreach if your “face” isn’t on. That is where a good PR pro can really help a startup. Over and above that, they can help them build the community they need which can, when it’s done well, significantly replace traditional outreach, or at least supplement it to a large degree. I think that’s a great point Shonali. A startup is always in a state of evolution but you’ve got to have your house fairly well in order before you put the spotlight on it. First impressions are huge. I think a lot of small businesses are still vary of investing too much in Social media and organic SEO. I think you need a two year strategy to bring meaningful results. The time needed coupled with current economic conditions makes it difficult for smaller businesses to understand the true value. PR also plays a major role in a start-up because of the publicity it brings. It gets people’s attention and makes them think about the product. If there is a product and no one know about it, then what is the use?